A Welders Protective Tool Apron You Ever Need It! Whenever you need a protector to protecting your body or delicate dress/ outfit from a mess ,then this creative apron with so many pockets just feet your needs than ever! 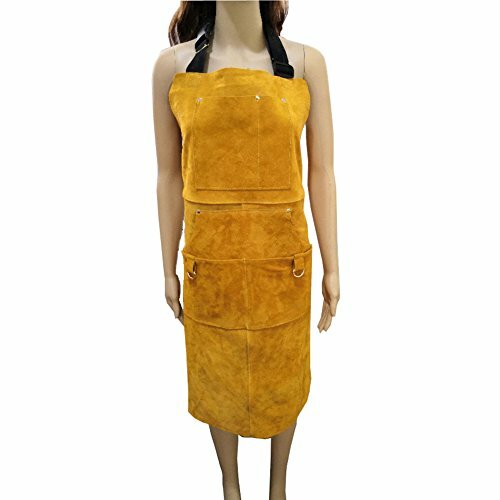 SUPERIOR PROTECTION: Heat & Flame-Resistant heavy duty split cowhide leather welding apron with Extra Long ( 24 inches wide x 36 inches tall ) full coverage apron protect you until the knee when you are working. DURABLE MATERIAL &HIGH QUALITY : Made of thick split cowhide for durability. And it is wear & flame-resistant for protection from flame and spatter. Sewing with strong, heat resistant US Kevlar thread. We pay attention to every detail, emphasis on quality. MULTI-FUNCATIONAL TOOL POCKETS: 5 pockets for tools and work accessories. Large, easy access tool pockets in front which can safely store different gadgets such as keys, cell phone, MP3, paper money, etc. LIFETIME QUALITY WARRENTY: If you're not COMPLETELY SATISFIED with our welding tool apron, you will get a 100% COMPLETE REFUND OR A NEW REPLACEMENT with no question asked.